Geoffrey Coffin has featured as organ soloist in several of our concerts, as well as playing on many occasions for the Remembrance Sunday Requiem Mass. Geoffrey Coffin featured as organ soloist in several of our concerts, as well as playing on many occasions for the Remembrance Sunday Requiem Mass. Geoffrey Coffin was organ scholar at Emmanuel College, Cambridge from 1965-68 and studied with Sir David Willcocks. He moved to York in 1971 on being appointed assistant organist to Francis Jackson at York Minster. While serving in this capacity Geoffrey also developed an interest in organ building and worked for a major English firm, both in Britain and, later abroad. 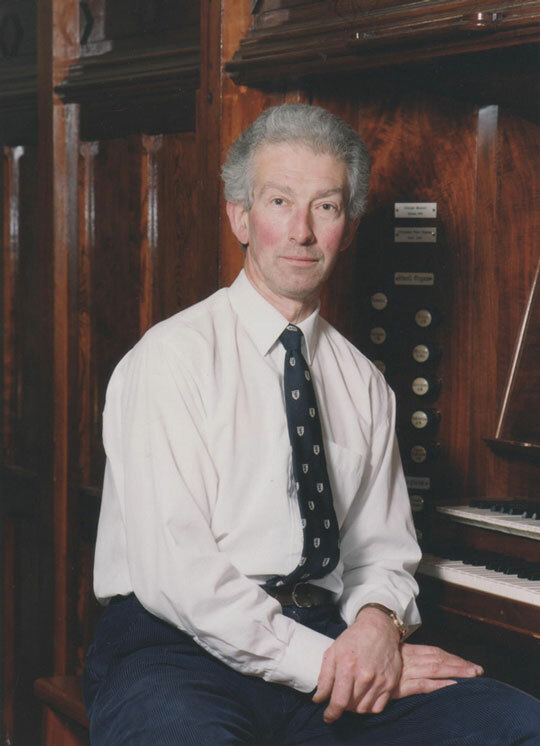 He established Principal Pipe Organs in York in 1983 and he and his staff of five built a number of new organs and undertook a huge variety of restoration work. Geoffrey has played widely in Britain, Denmark and Holland and has also participated in various broadcasts and recordings. He regularly accompanies several chamber choirs and instrumentalists besides continuing his solo and liturgical playing. The Academy of St Olave’s was founded in 1977-1978 by Charles Macdonald to help raise funds for the overhaul of the St Olave’s Church organ in 1978. Geoffrey Coffin looked after the instrument for many years, and undertook the reconstruction in 2004. Here is some information about the instrument following the 2004 reconstruction. Earlier organs were by P Conacher in 1856 and 1881. The latter transferred to St Lawrence, York, in 1906, and to St Mary, Lastingham, in 2011. The current organ was built by J W Walker & Sons in 1907. Overhauls and revisions took place in 1978 (J W Walker & Sons) and 1986 (Principal Pipe Organs). There was a major overhaul and reconstruction in 2004 (Principal Pipe Organs), to a scheme drawn up by the church’s Director of Music, John Hastie, incorporating two ranks from 1877 ‘Father’ Willis organ in the King’s Manor, York (formerly the Yorkshire School for the Blind). The organ is situated on the north side of the chancel, extending into a purpose-built chamber. The Great is sited above the console, behind the pipe-front; the Swell box sits against the east wall of the chamber, speaking south and west; the Choir box is on the west side of the chamber, facing south, with the shutters opening to the east. The unenclosed Choir is above the Great; the Pedal is mainly on the floor and against the north wall of the chamber, with the Trombone partly on the roof of the Swell box. The unenclosed Choir Trumpet is behind the aisle case. Casework Choir case: Walker 1907 pipe-rack facing south, containing 29 (5+19+5) Pedal Principal and Fifteenth (formerly Great Open No 1) pipes. Aisle case: facing west, by George Pace, 1953, containing 21 (3+15+3) Great Open Diapason (formerly Open No 2) pipes. For more details about the stops and pipes please see the full organ specification.